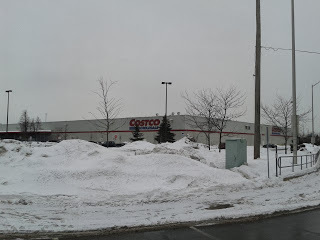 On a couple recent trips to Costco (1900 Cyrville Road, Ottawa) my wife and I have visited shortly after opening at 10 A.M. on Sundays. We have toured around, checked out and then proceeded to the food court area directly after the cash registers before exiting the store. There is a common line up queue to move through with two cash registers for customers to move up to. This is usually quite quick process as the order takers are pretty speedy in taking your order and obtaining your cash. We normally order two hot dogs, a fries and two soft drinks which usually rings up between six and seven dollars including tax. Not bad for a quick lunch for a pair of adults. The next step of obtaining your food is hit and miss. The first time there, my wife and I easily received everything we ordered in a timely fashion. The second time, I had to repeat to two different workers that all I needed were fries. Seems that if, like at McDonald's, if the supply of cooked fries cannot keep up with demand and a wait ensues, things fall apart. The order taking to fulfilling the order is lackluster as there is no computer guidance provided. Costco order takers call out the orders and the fulfillers put together the orders and bring them forward to the awaiting customer. If the food preparation, like the french fries, is behind and orders continue to come in, the fulfillers get confused. If a computer order system like at McDonald's or A&W were implemented, the orders would be easier to keep track of instead of by the current haphazard method. Once you have obtained your food the next stop is the condiment station. Pretty well stocked area with the usual serve yourself fountain pop, napkins and straws. The only additional items are the several hot dog toppings to choose from. This condiment station reminds me of a slightly longer version of a hot dog stand. 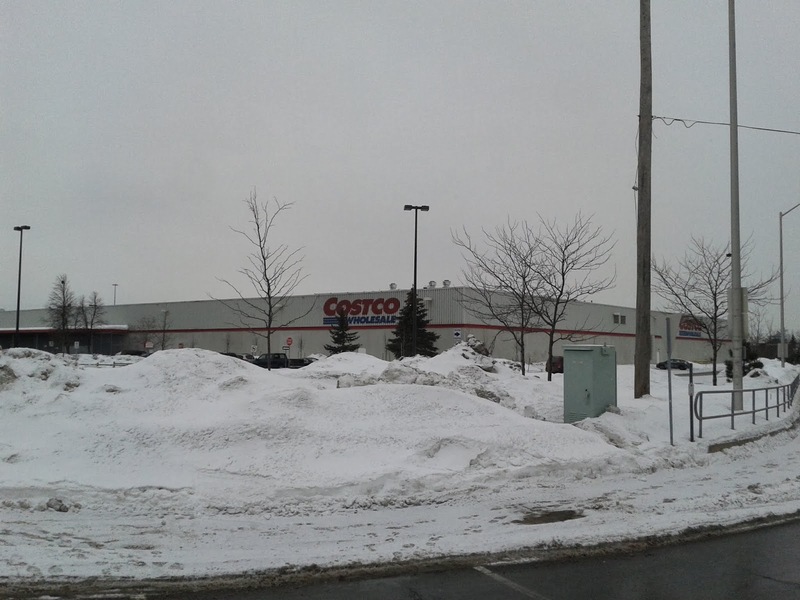 The next Costco challenge comes next. You have topped your hot dog, gathered your napkins and straws, which means it is time to manouvre your way, without spilling your pop from your overflowing tray, to find a seat. At Costco Food Court file this under good luck! No matter what time you are there whether it be 11 A.M. or the ever popular 12 Noon to 1 P.M. lunch our, you are pretty well out of luck. The lack of seating even at the non busy times is appalling. There just is not enough tables to fulfill customer demand. We have tried a couple of times to do this shortly after 11 A.M. to find a spot. The first time we were offered by an older married couple the opportunity to share their table of four. The second time we were smarter. We reviewed the seating options before ordering our food. We found two empty tables and I left my wife at one while I ordered our hot dogs, fries and soft drinks. We ate our food in peace watching the family of four with their overstuffed shopping carts circle around the tables like vultures waiting to pounce. A Costco Food Court Tip: Have someone find a table before you order. This will prevent you from circling the small seating area while balancing your overflowing tray looking for a table. The food quality is pretty good for the price paid. The hot dogs remind me of the Italian sausage style hot dogs you find at a downtown hot dog stand. Pretty tasty along with all the toppings you could choose from. The fries though are a little questionable. Sure the quantity is there, but the quality needs improvement. The main point of contention is the fries are breaded instead of fresh cut style. The breaded quality is different than normal and may be the "Costco take" on the traditional hot dog and fries concept. The fries though seem lower quality than what is found at a traditional food court establishment. Perhaps a rethink of the fries is in order with an attempt to see if Nathan's style crinkle cut as an option. Breaded just doesn't seem to work. Otherwise the fries and accompanying ketchup quantities available are excellent. Overall, the Costco food court experience is pretty average greasy fast food. The service, if everything goes right, is good. The food quality is average with nothing special. Seating needs to be relooked at in terms of matching space to customer demand. This particular Costco needs more spaces for customers to sit. There is nothing worse for a fast food place than having customers salivating over their meal with no place to sit.